Posh chairman Darragh MacAnthony pictured before the defeat at Burton Albion. Photo: Joe Dent/theposh.com. Owner Darragh MacAnthony has rubbished claims that he wants to sell Peterborough United. Reports in a national newspaper yesterday (August 23) suggested that MacAnthony had slapped an £8 million price tag on the club. The same report claimed that an ‘Israeli consortium’ had shown in interest. MacAnthony bought Posh in October 2006 and has overseen three promotions and two relegations. 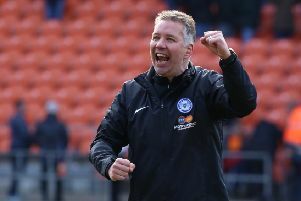 Posh have spent more seasons (three) in the Championship during MacAnthony’s nine years at the helm than in the club’s previous 46 years as a Football League club. Posh remain financially dependent on their owner. The club owe DMA Holdings S.A, a company in which MacAntony has a financial interest, over £5 million in loans.